Day two of the San Diego Omnium started off on a cold, wet, and early morning at Fiesta Island, just north of downtown San Diego. As I warmed up under a canopy in the wee hours of the frigid day with my close friends and old Junior teammates; Justin Oien (Axeon Pro Cycling) and his brother Eric (Monster Media Junior Devo) we cursed the weather and prepared for the 3 lap time trial that lay before us. As expected, the time trial was painfully cold and wet. Satisfied with the effort that earned me a 5th place, I warmed up and recovered for the second part of that days racing later in the afternoon. Once again, in a very similar picture, I warmed up along side of my friends, this time in the parking lot of the UCSD hospital. As the smaller field lined up for the 70 minute crit I knew that it would be hard to beat Spy’s team, as they had 6 or 7 riders in the 25 man field. My tactic for the race was to not miss a move that Spy was in as the day before I had missed out. About 15 minutes into the race my friends Justin and Eric attacked with an SDBC rider. I knew that this was a dangerous move, but since Spy wasn’t in it, I didn’t pursue to bridge or chase. Shortly the SDBC rider was dropped which left the Oien brothers to ride a two man Time Trial. Without any teammates, I rode 3-4th wheel to stay safe as Spy attempted to chase down the brothers. Spy was having a hard time keeping on top of the speed which helped the brothers stay away for almost the entire race with Eric getting caught with about 6 laps to go and then Justin within 3 to go. As soon as this happened I started getting ready for the sprint and got on Thurlow Rogers wheel with 3 to go. Knowing this was a great wheel to be on I didn’t give it up until he went to the front with a lap to go to lead out his teammate Tommy Robles(Amgen) and in turn I jumped onto Blake Anton’s (Clif Bar) wheel. Coming up the final riser with about 450 meters to go Thurlow punched it and Blake kept on it going around the last corner and down the last chicane. With about 200 meters to go I started my sprint up and came around Thurlow and Blake. As I went head to head with Tommy, I knew I was going to take it. And with great excitement, I did in fact take the win! 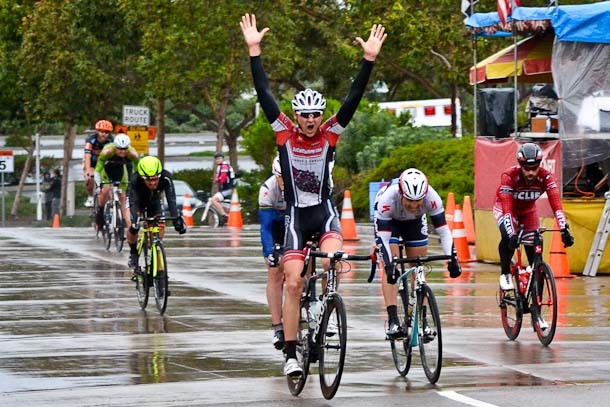 With shock and amazement that I had won my first Pro 1-2 race I threw my hands up! All the pain in the legs, the frozen fingers, and the soaked core seemed to forget about the battle it had just went through in the midst of pure joy! I said a quick prayer of thanksgiving, and then went to celebrate and receive congratulations from my friends and family. I ended up earning a 6th in the Omnium a well! A great way to end a great weekend of racing! I want to thank SDSU, SDBC, and UCSD cycling clubs for putting on an incredible race, my coach Pat Jak for everything so far. Thank you to all of our SoCalCycling.com Team sponsors – SoCalCycling.com, Cannondale, SUGOI Performance Apparel, Full Speed Ahead (FSA), Pacific Premier Bank, Echelon Design – Web, Graphic & Photography, ROL Wheels, Clif Bar, KMC Chain, Fi’zi:k, Incycle Bicycles, Continental Tires, TRP Brakes, Larsen’s Restaurants and the Ontario Police Officers’ Association.